Our company holds expertise in supplying superior quality Thread Lockers for our clients. With the lightning support of our prominent vendors, we are able to offer the best quality range of Engineering Adhesive. 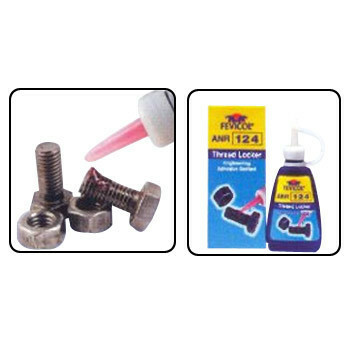 The wide assortment of products offered by us include Anaerobics Adhesive, Cyanoacrylates Adhesive, Epoxy Adhesive, Cyclo, Cyclo M.R.O. Products For Electrical, Cyclo M.R.O. Products For Mechanical and Choke Ballast for CFL. The entire range of products is extensively used in Heavy Engineering Industries, Engineering Assembly line, Automobile Assembly Line and all other Manufacturing Line. In addition, we also offer the most preferred range of Plasti Dip, Rubber Coating, USPRO, Polyurethane Construction Foam and Epigen Epoxy Coating. Our company has enormous experience in this domain and has served many customers with a wide range of product range that are flawless and performance oriented. We strictly follow international quality standards in the process of offering our product range. Our company also undertakes bulk orders and deliver them within a stipulated time frame to meet the demand of customers.